Please refer to the Anglican Church Diocese of Moosonee Search Request form in pdf format to make a request for parochial records. Please be advised that this form isobligatory in order to submit your search request. These are the only records located in the archives with information that could be relevant to genealogical research. If you are enquiring about any other records or publications (census, microfilms of newspapers, or books) pertaining to genealogical research, please refer to the online catalogue, Borrower Services desk, or reference email. 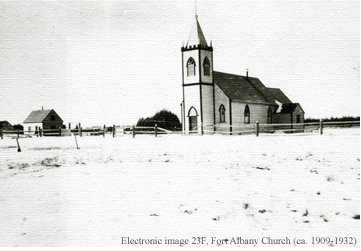 If you would like information on how to access the parochial or other records from the Anglican Church Dioceses of Moosonee, you can send a detailed email to:archives@laurentian.ca or you can call the Archives at (705) 675-1151 ext. 3306. In an effort to ensure the preservation of their records and to facilitate access, the Anglican Diocese has deposited their records at the Laurentian University Archives. We provide access under the policies and conditions stipulated by the Diocese of Moosonee. The records deposited in the archives were generated by the Synod Office and by parishes of the Diocese. The Synod Office records consist of administrative and historical diocesan records documenting the history of the diocese. Information concerning parish registers can be found under the following Parochial Records section. Archives staff will provide assistance with research services; however, we are unable to commit to more than two hours of our time for such research. As an alternative, we can provide you with names of freelance researchers who, for an hourly fee, can do the research for you. Although we can provide you with names of researchers, it is your responsibility to negotiate the agreement with him or her. The LU archives is not responsible for the research done by these researchers. The following PDF document outlines the policies and conditions for accessing the parochial records. It will allow you to determine your eligibility for access, and it will identify the information that you will need prior to making a request. For each of these locations the Archives may have all or some of the following parochial records: Parish Registers including baptism, confirmation, marriage, and burial records; service books; minutes; vestry books; account books.